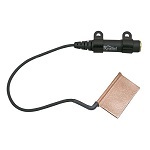 From the makers of the Realist Copperhead comes the Realist "LifeLine", our newest bass pickup. 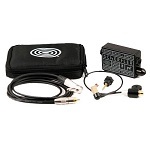 The LifeLine comes from the most trusted name in acoustic amplification. Like its predecessors, it?s based on a concept of durable, self-powered, transparent piezo pickups that are easy to use. And like the popular Realist Copperhead, it?s made in the USA. 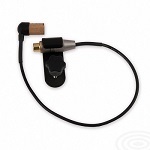 The Realist LifeLine offers a focused bass sound for those musicians who want a lot of punch without loss of fidelity. 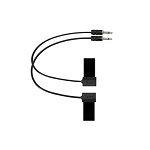 It performs well at high volumes, offering a clear sound without boom. Mounted at the adjuster without glue or fasteners, the LifeLine will fit on most bridges without changing a thing, and it's just as easy to take off. Once installed, the simple design disappears, not drawing attention to itself, preserving the natural beauty of the instrument. 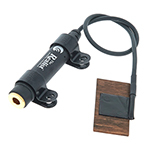 Transducer for bass, wood element, 1/4" input jack. Very transparent sound color, although texture is very slightly compressed. Easy to amplify. No need to re-attenuate amp settings between arco and pizz. Adjust volume on-the-fly, no matter which string bass pick-up is installed. This no-fuss dock installs to the tailpiece without fasteners. Simply loosen the strings, mount, tighten. You’re in control. 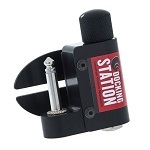 The Docking Station solves jack mounting problems, too. 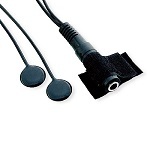 The cable is dressed away neatly from the ?” input/output without additional hardware. 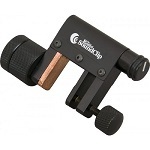 The tension of the strings holds The Docking Station to the tailpiece, like the “loop” from the industry standard Realist “Copperhead” pick-ups. Works with all pick-ups, no batteries required, a passive system. Achieving the perfect amplification of an acoustic bass is a dream of many jazz bassists. In delivering the most natural sound possible, DYN-B takes players a step nearer to that goal. Ideal for orchestral and pro audio/broadcast applications, DYN-B is also popular with sound engineers. 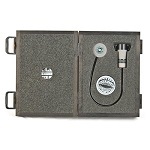 Easily and safely fitted to the body of the double bass, using special adhesive putty, the sensor can be appropriately positioned to capture the best tonal qualities of the instrument. It can also be easily moved from one instrument to another. DYN-B’s balanced, low impedance output reduces the risk of hum and radio frequency (RF) interference, even with long cable runs. 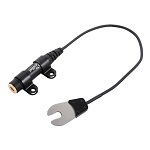 An XLR connector allows direct connection to mixing desks or preamplifier inputs. Stephan Schertler's classic transducer and first product, the STAT pick-up established his reputation for innovation. First introduced in 1986, today thousands of musicians throughout the world depend on the STAT transducer. The patented Schertler STAT-B electrostatic bridge pick-up stands out for its high feedback resistance and for delivering an impressive bridge tone without the harshness or distortion of piezo pick-ups. A very simple system that delivers the complex tone of the double bass, STAT-B works with any bass amplifier. The standard STAT-B Set includes pick-up, cable and the battery-powered STAT-PRE preamplifier with volume control. Stephan Schertler's classic transducer and first product, the STAT pick-up established his reputation for innovation. First introduced in 1986, today thousands of double bassists throughout the world depend on the STAT transducer. The STAT-B SELECT includes the sophisticated Preamplifier YELLOW SINGLE Preamplifier and YELLOW BLENDER Preamplifier with its regulated AC power supply. Preamplifier YELLOW SINGLE powers the STAT-B and includes controls for gain, bass, treble, resonance and volume.